Great Shoals Lighthouse was constructed in 1884 at the entrance to Wicomico River, Chesapeake Bay. The square cottage was pre-fabricated at the Lazaretto Depot in Baltimore and all the components were shipped to the construction site in July 1884. The light was completed in 32 days. In 1884 a fifth order Fresnel lens was installed. 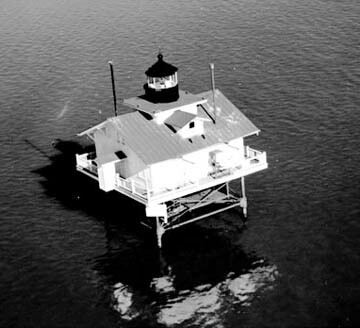 This lighthouse was deactivated in 1966 and replaced by a modern automatic light on the old foundation.